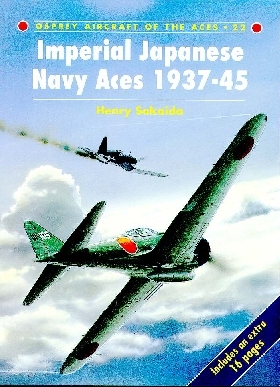 Book Review "IJN Aces '37-'45"
"Imperial Japanese Navy Aces 1937-45"
"Imperial Japanese Navy Aces 1937-45" by author Henry Sakaida is #22 in the fine British 'Osprey Aircraft of the Aces' series of aircraft books from Osprey Publishing (1998), is softbound, 112 pages long (16 pages longer than others in the series) and is ISBN # 1-85532-727-9. $16.95 retail. The cover shows a beautifully rendered color painting (MUCH nicer than the accompanying reduced-for-the-Internet version of the illustration) of Nishizawa's A6M3 Model 22 shooting down one of his forty-five (!) F4U Corsair victims in the South Pacific. Each page of this fascinating book generally has a 2/3rds width column of text with the remaining 1/3rd devoted to a B/W photo and caption. EVERY page (except one) has at least one illustration, sometimes several. The B/W photos of IJN aircraft are familiar ones to devotees, but few people have seen photos of the aces themselves. Most of the book is black and white, with a color plate section containing 11 pages of side views of ace's aircraft and markings, and two pages of uniforms. The book appeals to enthusiasts and modelers, who can revel in the exploits described in the short biographies, and create the planes themselves in miniature using the color renderings. Aces include Kenji Okabe, who set an early record for six planes in one day defending the Shokaku at Coral Sea; Yukio Endo, whose "Gekko" nightfighter downed eight B-29's at night; Shoichi Sugita, flying Shiden-Kai fighters with the elite unit formed by Genda; Minoru Honda who was given up for dead, and when he returned, was chastized for fouling up the paperwork and deliberately given assignments to insure he wouldn't return! The Appendices contain notes on the organization of the various IJN air groups, listing of aces and their scores, explanation of colour plates, and 1/72 scale drawings of various IJN aircraft in side view, with a special 5-view drawing of the A6M5 Model 52 .